Apple announced a whole bunch of stuff at its special media event on Tuesday, not the least of which was taking the wraps off two new iPads. Here’s everything we know so far about these latest iOS-powered tablets. What iPad news did Apple announce on Tuesday? 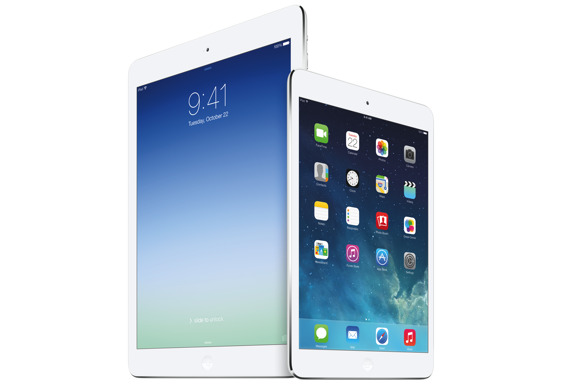 Apple unveiled both a thinner, lighter version of the full-sized iPad, called the iPad Air; and a second-generation iPad mini with an improved screen called the iPad mini with Retina display. 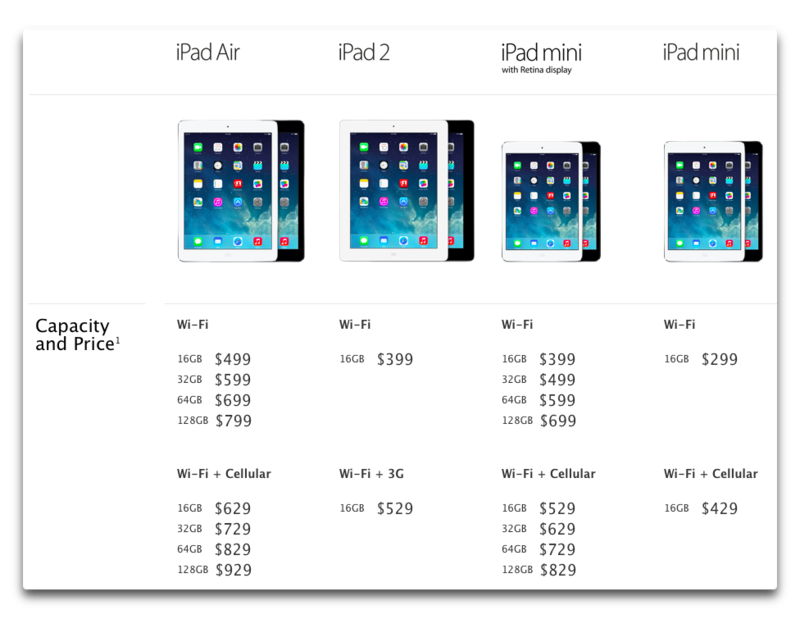 The iPad Air costs the same as the iPad it replaces. For Wi-Fi models that’s $499 (16GB), $599 (32GB), $699 (64GB) and $799 (128GB). For Wi-Fi + Cellular models, that’s $629 (16GB), $729 (32GB), $829 (64GB), and $929 (128GB). For the iPad mini with Retina display, the Wi-Fi versions will cost $399 for 16GB, $499 for 32GB, $599 for 64GB, and $699 for 128GB (a first in that capacity for the iPad mini). Cellular versions add $130 to each: $529, $629, $729, and $829, respectively. What about older versions? Is Apple still selling any previous models? Yes. The full-sized iPad 2 remains in Apple’s lineup at $399 for a 16GB Wi-Fi version and $529 for a 16GB Wi-Fi + 3G model. And the original iPad mini is still available for $299 for a 16GB Wi-Fi model and $429 for a 16GB Wi-Fi + Cellular version. All your iPad choices, and how much they’ll set you back. Will AppleCare+ cost the same for these new models? You may recall that Apple slipped in some updates to its AppleCare+ plans alongside the launch of the iPhone 5c and 5s in September. AppleCare+ is the special brand of AppleCare designed for iPhones, iPads, and more recently iPod touch and iPod classic models. With it, if you damage your device by your own hand—dropping it in the bath or cracking the screen, say—you can pay a deductible for Apple to fix/replace it. (You can do so up to two times during the two-year coverage period.) When Apple introduced its new iPhones, that per-incident cost went from $49 to $79. As of now, Apple’s AppleCare+ page for iPad still shows $49, so Apple hasn’t officially raised the fee for its tablets. But it’s always possible that could change before the iPads go on sale. As with other AppleCare+ plans, you need to either buy it at the same time as your iPad, or within 30 days of purchase. Don’t forget AppleCare+ for your new iPad. Speaking of which, when and where will they be available? Apple will start selling both the Wi-Fi and Wi-Fi + Cellular iPad Air (in most countries) on November 1—via the online Apple Store, Apple’s retail stores, and through AT&T, Sprint, T-Mobile, Verizon Wireless, and select Apple Authorized Resellers—starting at 8am local time. At this point, it doesn’t appear that you’ll be able to pre-order the iPad Air to get it on release day. The iPad Air will initially go on sale in 42 countries/territories: The US, Australia, Austria, Belgium, Bulgaria, Canada, China (Wi-Fi models only), Croatia, Cyprus, Czech Republic, Denmark, Estonia, Finland, France, Germany, Greece, Hong Kong, Hungary, Iceland, Ireland, Italy, Japan, Latvia, Liechtenstein, Lithuania, Luxembourg, Macao (Wi-Fi models only), Macedonia, Montenegro, Netherlands, Norway, Poland, Portugal, Puerto Rico, Romania, Singapore, Slovakia, Slovenia, Spain, Sweden, Switzerland, and the UK. Apple noted that this is the first time that China is part of the initial rollout for an iPad launch. The new iPad mini’s availability is more vague. All Apple said is that it will become available sometime “later in November” so we don’t know exactly when you’ll be able to buy one, if both Wi-Fi and cellular models will go on sale on the same date, or if Apple will announce any kind of pre-sale for that model. What colors do the new iPads come in? Is there a gold option? Alas no. Gold is still an iPhone-only hue for now. Both new iPads come in either space gray or silver colors. Do the new iPads include the Touch ID fingerprint scanner found on the iPhone 5s? No. The new iPads don’t offer the ability to use your fingerprint to unlock them, so you’ll still have to swipe and enter your Apple ID like a commoner. So if there’s no flashy Touch ID sensor, what’s so new about the iPad? Well, the iPad Air is a new form factor for the 9.7-inch iPad, though it’s one that you’ll immediately notice as being much more similar to the iPad mini. There’s a thinner bezel all around the display, especially on the left and right sides. The casing of the Air is also more similar to the mini than the previous iPad iterations, with metal buttons and a somewhat steeper beveled edge. Perhaps most significant is that all of these improvements come with a net weight reduction—the iPad Air weighs in at just one pound, 28 percent (0.4 pounds) lighter than its predecessor. It’s also 20 percent thinner and has 24 percent less volume than the fourth-generation iPad. And the iPad mini, does that change at all? The biggest obvious change is the addition of a 2048 by 1536 Retina display. That’s the same number of pixels as the 9.7-inch iPad, albeit crammed into a much smaller display. As with the larger iPad, it makes text and images crystal clear, and with iOS 7’s insistence on thin lines and fine text, that’s bound to be a welcome improvement. The iPad mini with Retina display. Are these new models more powerful than before? The new iPad models include Apple’s 64-bit A7 chip and M7 motion coprocessor—which can monitor the device’s various motion sensors (accelerometer, compass, and gyroscope) without having to wake the main processor—both of which debuted with the iPhone 5s. 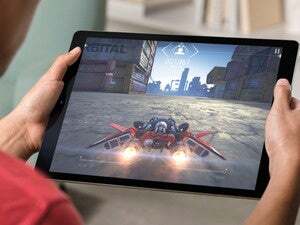 These should add up to much better performance and graphics power than before: Apple says that translates to up to twice both the CPU and graphics performance as the previous iPad. Both models takes advantage of faster 802.11n Wi-Fi thanks to MIMO (multiple in, multiple out) support with two antennas, though they don’t yet pick up the 802.11ac standard that’s becoming popular in the Mac line. They also have expanded LTE support for more countries around the world. And there’s now official T-Mobile support for the iPad. Surely those new processors and the Retina display on the iPad mini will impact battery life negatively? Apple actually claims the same 10-hour battery life on the new iPads as it did on the previous generations. But we’ll have to wait until we get our hands on them to test out real-world battery life and how they compare to their predecessors. Something else you want to know about the new iPads? Post in the comments and we’ll update the story.